Its astounding resolution is well deserving of this exclamation mark! 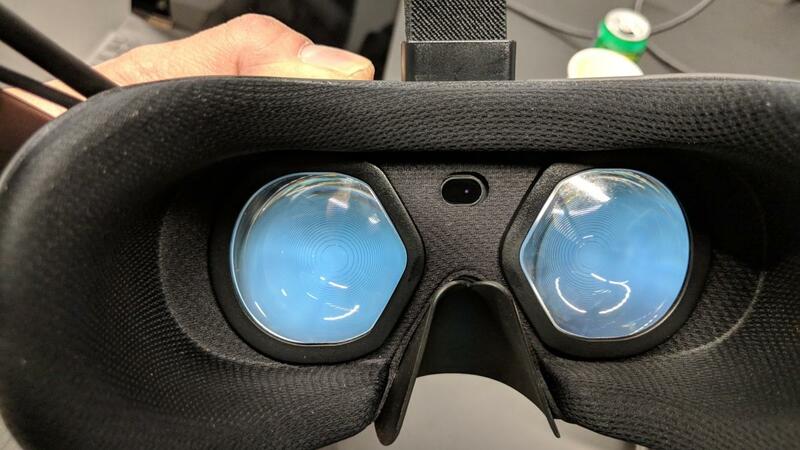 That dreaded low-resolution "screen door effect" that's dogged virtual reality imaging since its inception just got blown off its hinges by HP's Reverb VR headset. Announced Tuesday at HP Reinvent in Houston, the Reverb boasts twice the resolution of its predecessor—2,160x2,160—plus a wider 114-degree field of view. The Reverb is the highest-resolution HMD (head-mounted display) that's shipping among "major" makers, the company said. That caveat of "major" HMD makers obviously excludes such smaller projects as Pimax's 8K headset. Even so, HP's Reverb will likely ship ahead of Pimax's unit. 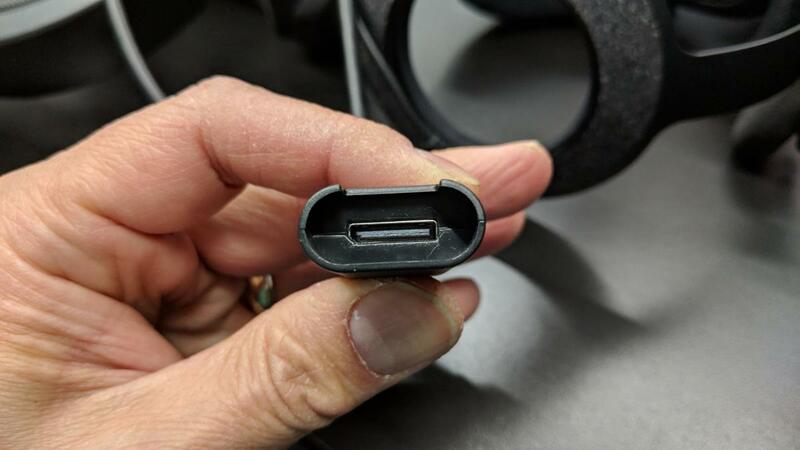 The controllers don't change for HP's Reverb, but the company has integrated Bluetooth into the headset to improve connection issues. HP's also improved the tracking algorithms. 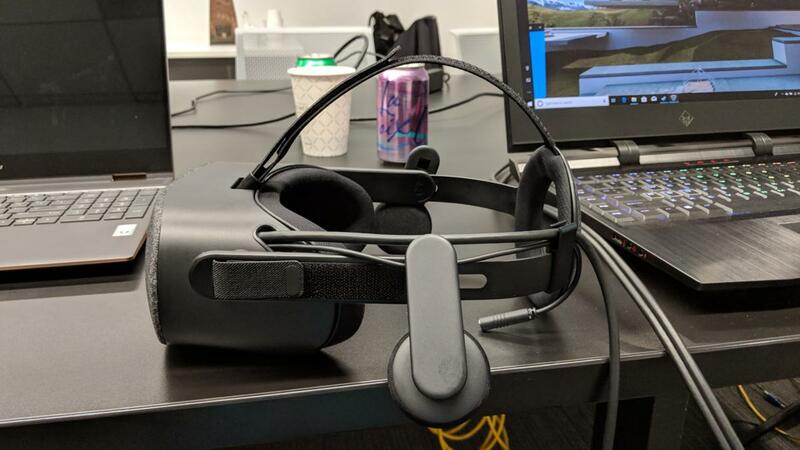 The headset itself continues to be based on Microsoft's Windows Mixed Reality platform. 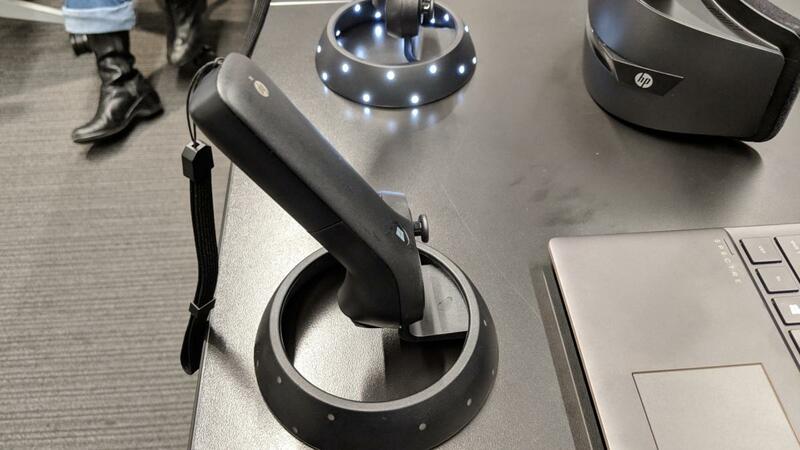 It still uses the standard Mixed Reality controllers, which link via Bluetooth and are tracked using Mixed Reality's Inside Out technology. When launched, the tracking technology was promising, but it had weaknesses. Rather than the HTC Vive or Facebook Oculus systems, which use separate towers to help tracking, the Reverb uses "inside out tracking," which doesn't require additional hardware and calibration. The advantage to inside out tracking is it can be easily moved from room to room. It's somewhat less accurate than using separate towers, however, and issues arise when a hand moves out of view of the inside out tracking. (Read our review of a Mixed Reality headset for more details.) HP officials say improved algorithms have addressed such issues to some degree. What's also really helped is improved Bluetooth. The original Mixed Reality headsets counted on Bluetooth support in a gaming PC to handle the connection. HP discovered that subpar Bluetooth implementations were a weak link in the experience. By integrating a Bluetooth radio directly into Reverb's headset, HP can better guarantee a level of connection quality. Screen door? What screen door? With its much higher resolution, clarity of text and the sceen door effect was all but eliminated. The star of the show, though, is the new Reverb headset and its resolution per eye. 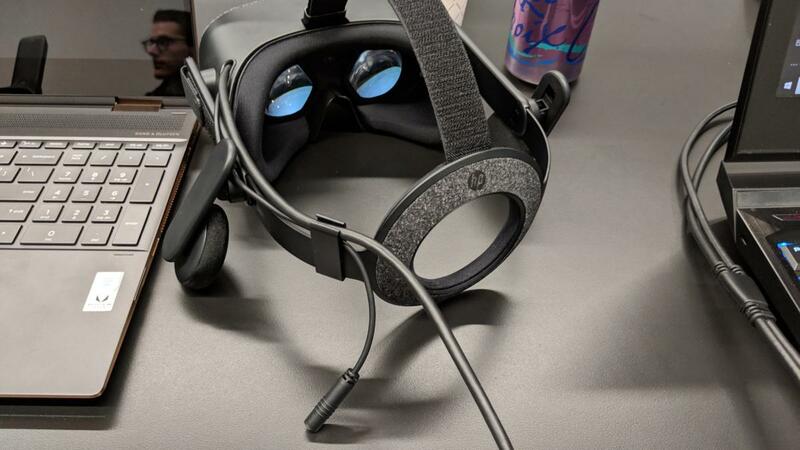 At 2,160x2,160 pixels, it's more twice what was available on HP's original Mixed Reality headset. We got to compare it to Samsung Odyssey+Mixed Reality headset, which features dual AMOLED screens with a resolution of 1,440x1,600 per eye (essentially the same as HTC's current Vive Pro). The difference was astounding. The Odyssey+ with Samsung's Anti-SDE screen technology is already considered one of the better headsets, so that's saying something. Unlike the Samsung, which uses AMOLEDs, HP continues to rely on LCD screens at up to 90Hz and an impulse backlight to reduce motion blurring. 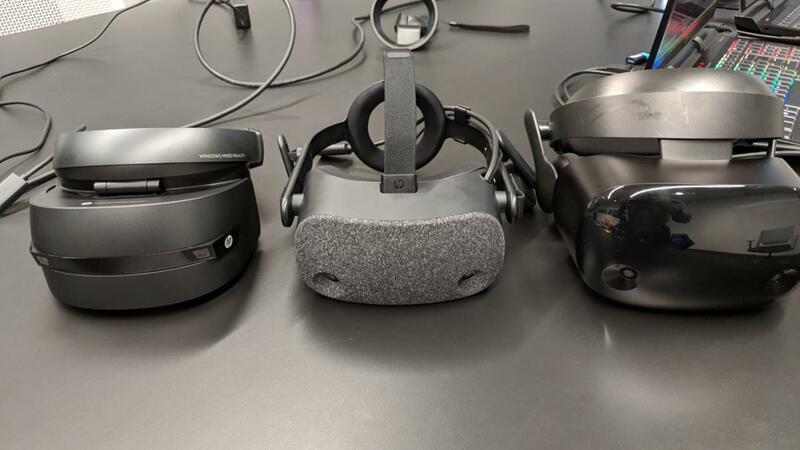 HP's original Mixed Reality headset on the left, HP's new Reverb in the middle, and a Samsung Odyssey+ on the right. HP didn't just drop new screens into an old design and call it a day, either. The company has completely redesigned its Mixed Reality headset. Gone is the clamping headband in favor of a Velcro top band. The weight of the Reverb is about 1.1 pounds, about two-thirds that of the Vive Pro. The Reverb includes integrated earphones, which can be removed. HP's Reverb integrate headsets which can be removed. HP will sell a Reverb Consumer Edition, which features a machine-washable face cushion and longer wire harness. For commercial users—which is the primary focus of the Reverb—HP will sell the Reverb Professional Edition, whose leather-style face cushion can be wiped clean with an alcohol swab. The Professional Edition also includes a shorter wire harness, as the company expects most applications to be used with backpack VR PCs. The company said it plans to sell the shorter harness to consumers as well, but no pricing was immediately available. The cable itself connects to a PC's DisplayPort and USB port, while a simple Oculink connector joins the harness with the headset. 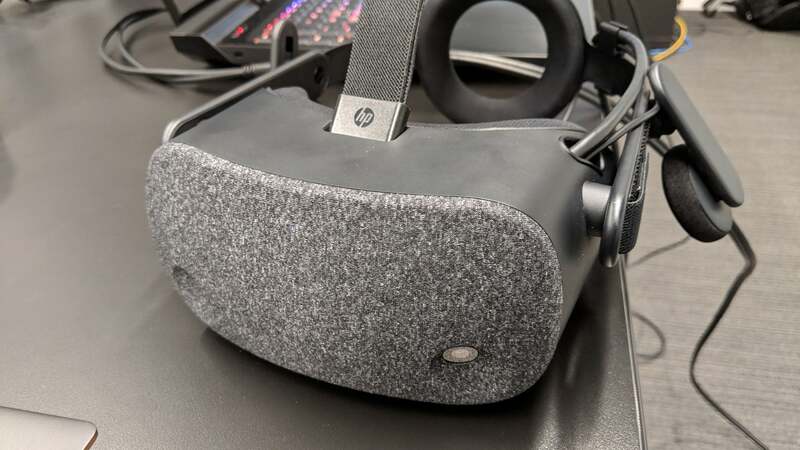 HP's new Reverb uses a PCIe-based Oculink connector to connect the HMD with a cable harness. With higher resolution, comes higher system requirements. Obviously, system needs will vary greatly by the actual game or application, but HP officials say a GeForce GTX 1080 or GeForce GTX 2070 are recommended. HP's new Reverb rests on your head using Velcro bands and this donut on the back. It's fairly comfortable, and at 1.1 pounds it's quite light. How much will the HP Reverb cost? HP said the Reverb Consumer Edition should go on sale late next month for $600. That's an increase in pricing over the original's $450, but also a considerable upgrade. HTC's basic Vive continues to sell for $500 and is the very definition of screen door effect. HTC's Vive Pro pushes the price (for the headset only) to $800, but the Pro is aimed at commercial users. HP didn't announce pricing of the Professional Edition, but because it will include a commercial-class warranty, don't expect it to be cheap. The HP Reverb will go on sale in late April for $600.